You can read this and other reviews on my blog: Mommy's Reading BreakI hadn’t heard too much about Before I Fall, but I had seen that a lot of people had read and enjoyed it, so when I saw the audio book available on my library’s website, I decided to give it a chance. It sounded really good, and I went into it very optimistically.Before I Fall starts with a prologue, and I was a little confused. Of course, I was listening to the audio version and was slightly distracted, so that’s not surprising. However, I went back and listened again and understood what was going on.Once the story actually started, though, I was a little nervous. At the beginning of Before I Fall, Sam is your stereotypical popular girl. She has everything she could ever want, and she and her friends are very quick to pick on the have-nots or unpopular kids. Ugh, honestly, she was very unlikable for a good portion of the book. 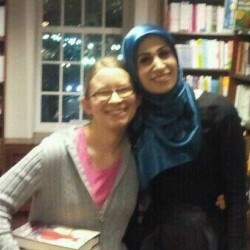 However, I remained hopeful. It’s pretty safe to assume that if you’re living the same day over and over again, you’re going to have to learn something, and a lot of people loved this book so I assumed that she did.What I liked most, and what ultimately kept me feverishly listening, were the little changes from day to day. After Sam dies on the first day, she is bound and determined to change her fate, and so each day, she makes different decisions, which lead to different outcomes. Like when I read Parallel, I was always curious and fascinated to find what effects her changes would have. As can be assumed, each day, Sam learns new things and starts to understand herself and the people around her a little more. I really enjoyed learning new things along with her and watching her grow. Sometimes she still frustrated me, but she did grow and learn and ultimately become more likable.The ending really surprised me. It was emotional, as I expected, but Before I Fall did not end how I expected, and looking back, I thought that was really great. I can’t really talk too much about it without spoiling everything, but I thought it was a great ending, and definitely had me choking up.As I stated before, I listened to the audio version of Before I Fall, and I thought it was great. Sarah Drew spoke a little faster than most narrators I’ve listened to, which threw me a bit at the beginning, but as I got used to it, I totally thought it fit. I don’t know about you, but as a teenage girl, I definitely talked a lot and very quickly! She never spoke too quickly to understand, and I just thought her voice was a perfect fit for Sam. I would highly recommend that audio version of Before I Fall!Overall, I thought that Before I Fall was a very interesting story, and I absolutely loved seeing the repeating days and the changes they made. 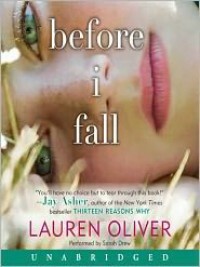 I would highly recommend it, and I look forward to reading more from Lauren Oliver!